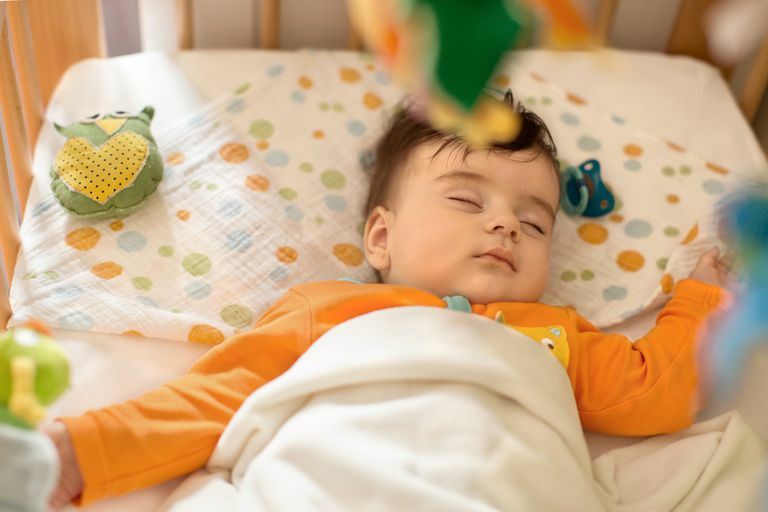 When it comes to the safest baby sleeping positions for infants, on their back is the clear winner, says the American Academy of Pediatrics (AAP). The reason: This sleeping position has been shown to reduce the incidence of Sudden Infant Death Syndrome (SIDS). In fact, since 1992, when the AAP began recommending that all newborn babies (from birth to age 1) be put to sleep on their backs, during naps, and at nighttime, the annual SIDS rate has declined more than 50 percent. And there's been no increase in choking or aspirating since that time. While research is still underway, studies suggest that babies get less oxygen and get rid of less carbon dioxide when they sleep on their bellies. In other words, while on their stomachs, an infant is only able to re-breath air from a small pocket of bedding pulled up around the nose. Still, other findings point to the fact that many babies who die from SIDS have underdeveloped regions of their brain, perhaps areas that prevent them from waking up to remove themselves from danger (like suffocation). And since it's impossible to figure out which babies won't arouse normally, it's better to be safe than sorry. Getting your newborn in the habit of falling asleep on his back may seem near impossible, as many babies seem to fall asleep better on their stomach or side, especially when curled up on a parent's or caregiver's chest. Rest assured, however, that in time your infant will get used to this safe baby sleeping position. Of course, once your child is able to roll over, he may reposition himself. Opt for a firm sleep surface. Purchase a safety-approved crib mattress, covered by a fitted sheet, and never place your baby down for sleep on soft surfaces, like pillows, quilts, and sheepskins. Keep the sleeping area clean and clear. This means no soft objects, toys, pillows, blankets, quilts, sheepskins or crib bumpers. Keep your baby’s sleep area near but separate. While your infant can sleep in the same room as you, he should not sleep in a bed or on a couch or armchair with adults or other children. Instead, your baby should sleep in a bassinet, crib, cradle or a bedside co-sleeper. Monitor the temperature in your baby’s room. In other words, not too hot or too cold. And never place your infant near air-conditioning or heating vents, open windows or other sources of drafts. Skip the blankets. Instead, invest in (a one-piece sleeper or sleep sack as an alternative to blankets. Consider a pacifier. Pacifiers have been shown to reduce the risk of SIDS, but don't force it if your baby doesn't want it.